While many start off the new year the proud owners of new bags, clothes or mobile phones, one charitable mother is hoping to offer orphans in Zimbabwe a new home √¢‚Ç¨‚Äú and the chance of an education. 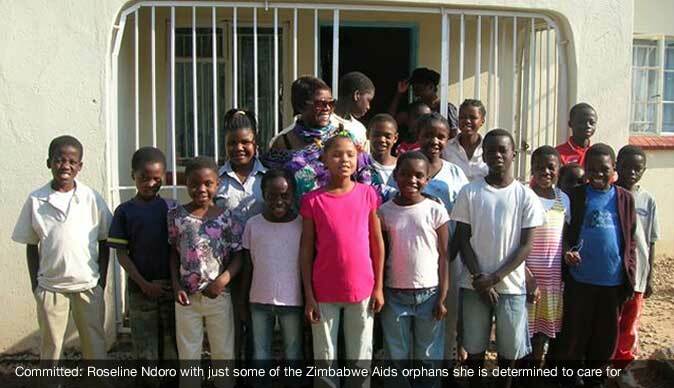 Twickenham resident Roseline Ndoro launched the Ndoro Children's Charities (NdoroCC) in 2008, after seeing the tragic plight faced by children in her native Zimbabwe, orphaned as a result of HIV and Aids. Due to her hard work and people's generosity, plans to build an orphanage and school on her father's land in Zimbabwe are currently under way, which is set to house and educate some 200 children. Mrs Ndoro first came to the UK in 1974, when she was 17, to train as a nurse. After spending more than a decade away from her home country, the mother-of-three returned to Zimbabwe in 2005 and was shocked by the scenes of deprivation that greeted her. The 60-year-old said: "I was emotionally and physically affected by the plight of the people there, especially the children orphaned as a result of HIV, Aids, TB and cancer. "What I saw was far removed from the Zimbabwe I grew up in, and our lives in the UK. "The experience left me with a vast feeling of emptiness and helplessness. "I counted no fewer than 16 orphaned children among my extended family." She decided action needed to be taken and the idea for a charity emerged. However, her plans had to be put on hold after she discovered she had breast cancer in January 2006, just weeks after returning from her trip, only for her partner to die from a heart attack that same year. During the difficult time she said the thought of helping the deprived children kept her going. She said: "When I was ill that's what made me better, because I had something to hold on to. "I said 'No, I cannot die now'." After recovering from her trauma Mrs Ndoro began to concentrate on getting the charity up and running and in 2008 NdoroCC was launched. It aims to support the underprivileged children in the poorest parts of the world √¢‚Ç¨‚Äú with an initial focus on Zimbabwe √¢‚Ç¨‚Äú by focusing on the development of education, health promotion initiatives and social services. Mrs Ndoro, who lives in Sixth Cross Road, currently divides herself between Twickenham and Zimbabwe to help provide children with educational tools, food and to supervise the building project. She hopes the school, once up and running, will become self-sufficient, and will teach the youngsters how to "stand on their own two feet". She said: "It will teach them skills. We want the school to be self-sufficient and market our produce. "The land is opposite a game park. The children will be able to see giraffes, rhinos and lions. "I'm really positive about building this school." However, she admitted the situation in the country was still dire √¢‚Ç¨‚Äú with more than 6,000 registered orphans in the district of Zimbabwe, where the school is to be built. She said: "Most people are unemployed, people are still getting HIV, people are still dying." When in the UK she busies herself with fundraising events, including holding a Christmas fair at the Twickenham United Reformed Church, in First Cross Road, in November. Roseline is helped in her task by her three children, including her 31-year-old son Ronald, who has taken time out from training as a lawyer to become the charity's UK operations manager. He said: "We are a small charity focused on making a better life for children all over the world. "One in four children in Zimbabwe is an orphan because of the HIV crisis, and with the economic crisis and political unrest, it is a tragic state of affairs." NdoroCC also has a number of high profile supporters behind it, including Twickenham MP Vince Cable, who serves as the charity's patron, and ambassadors including the lead singer of the Noisettes pop group Shingai Shoniwa, and manager of the England cricket team Andy Flower. Dr Cable said: "I am very happy to support the Ndoro charity. "Roseline has worked tirelessly, and in a country with an estimated 1.3m Aids orphans, the charity provides exactly the kind of help Zimbabwe needs." To make a donation to the charity visit ndorocc.org.uk.